Everyday Food Made Simple: Asparagus Cream Soup! We just had our Kansas City Super Saturday yesterday and it was a BLAST! It was so neat to see so many of my Consultants there! My parents were even there doing part of the training. Chef Todd was a lot of fun and made a few dishes for everyone to try....so yummy! One of my favorites was his Creamy Smooth Asparagus Soup. YOU have got to try it! My kids had some today and LOVED it! In a 3 quart saucepan, garlic and oil together. Add vegetables and stir. Add water and bouillon and stir well. Add all seasonings, cover with a lid, and simmer for about 10 minutes. Pour soup into a blender and blend until smooth. Pour back into pot, add cream, and bring to a simmer for an additional 5 minutes. 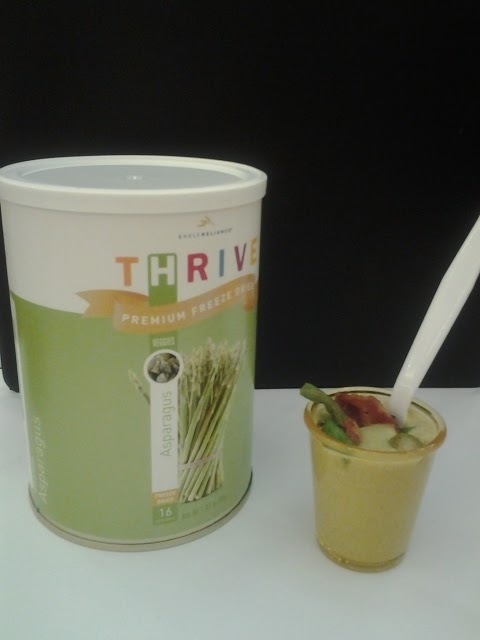 Serving idea: Serve with crispy bacon and reconstituted THRIVE Asparagus and Red Bell Peppers place at the center of each bowl of soup. To order Freeze Dried Asparagus...CLICK HERE! Vegetarian Lasagna from Chef Todd!